I’m breaking this up into 2 or 3 posts since I have so many pictures and video. The entire (very large) gallery can be found here with full size images. I spent the last couple of weeks on Black Rapids again. 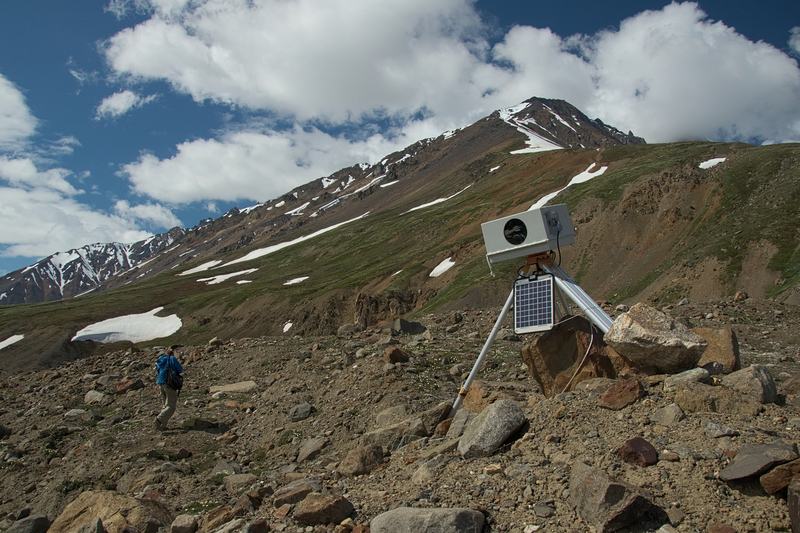 Summertime means that it’s time to maintain the 9 GPS stations, 4 time-lapse cameras, as well as other equipment we have out to monitor the motion, melt, and the drainage of marginal lakes. 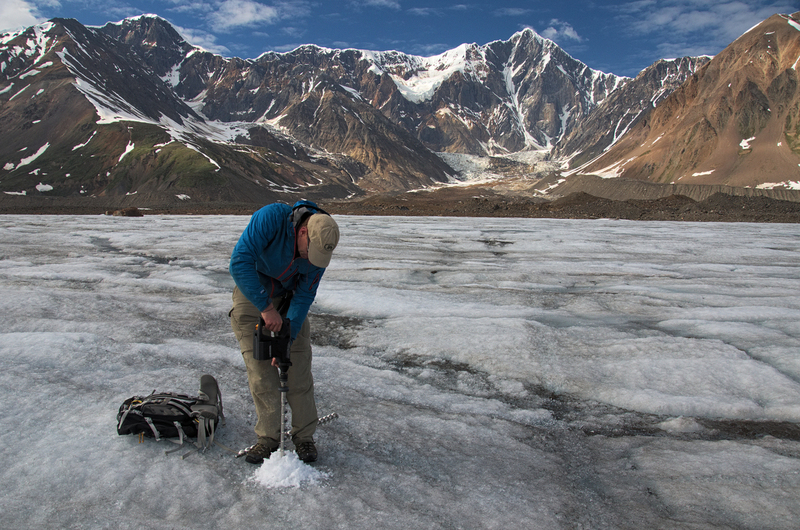 As the snow and ice melts the antennas, placed on poles drilled about 20 feet into the snow and ice start to melt out and sometimes need to be replaced or re-mounted. In addition to normal maintenance, we made this trip an extended one to hopefully catch the effects of a lake drainage with more survey equipment. 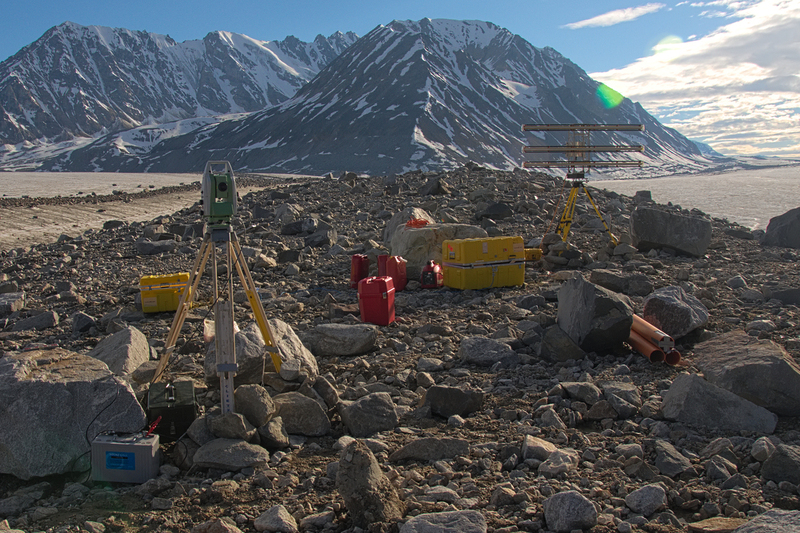 We brought out an automatic theodolite with 13 reflectors that we would place out on the glacier and a ground based radar to make interferograms that give a more complete picture of the motion of the surface than we can get by measuring a few points by GPS. 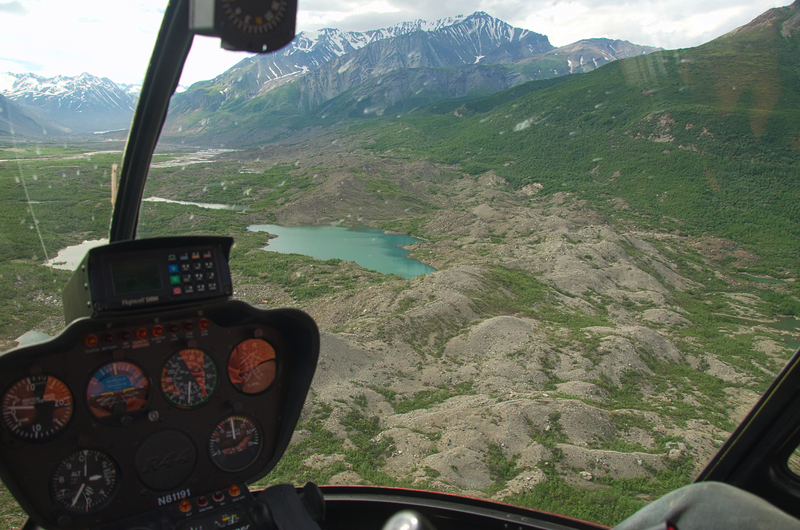 We flew in and out in an R44 helicopter (same type we used in August 2012 to pull gear out). 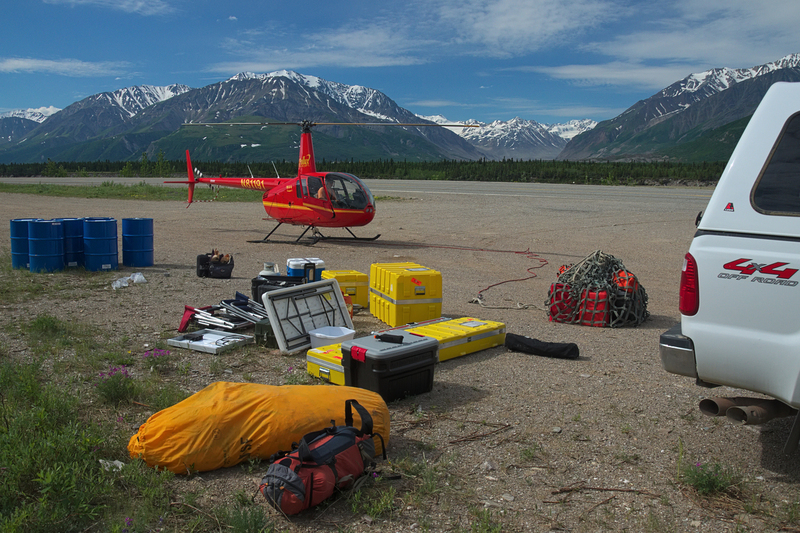 Since we were hauling quite a bit of gear in it took multiple loads and sling-loads to get everything out from the airstrip. Lakes, ponds, rocks, and brush compose the stretch between the Black Rapids terminal moraine and the Delta River. 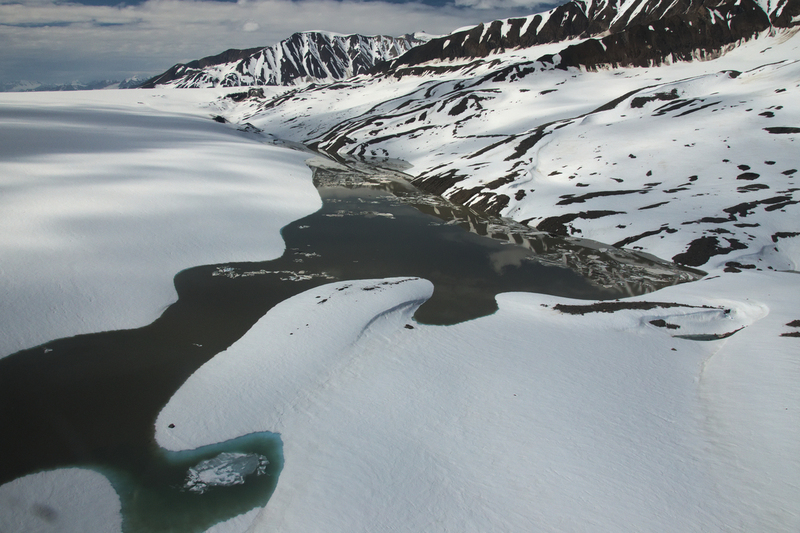 The glacier terminus was once here after a surge, you can kind of see its present location top-left. 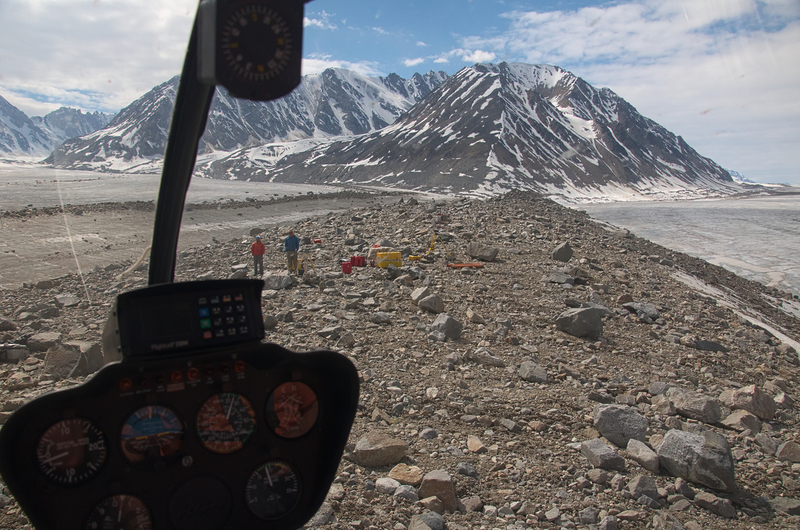 Landing at the location of our camp for the next two weeks on the medial moraine between the main branch of the Black Rapids glacier and the Loket tributary. 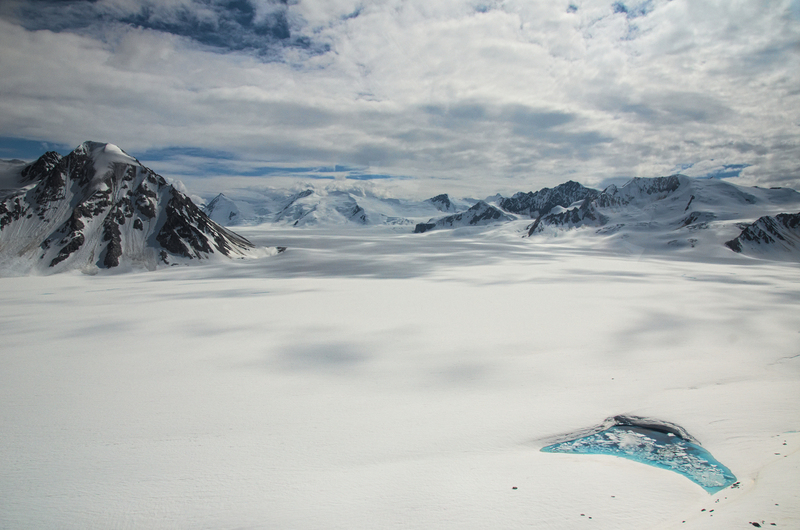 This spot provides a good view of both branches of the glacier and is pretty central to most of the equipment we need to access. After everything and everyone had arrived at camp, Martin and I flew up to one of the lake cameras that had a finicky power supply last spring. We managed to get it working, but may have missed the drainage with this one this year. The lake had already drained, so we wouldn’t be observing its effects this trip anyway. 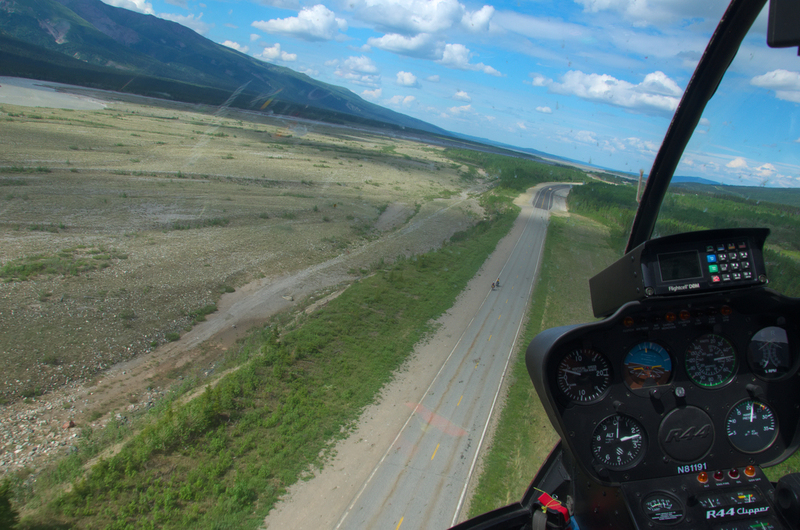 The first two lakes had already drained, so we flew up to the third near the Trinity Basin and potholes. Quite a few of the potholes were full on the way up. Bam! Aurora Lake is full to the brim. 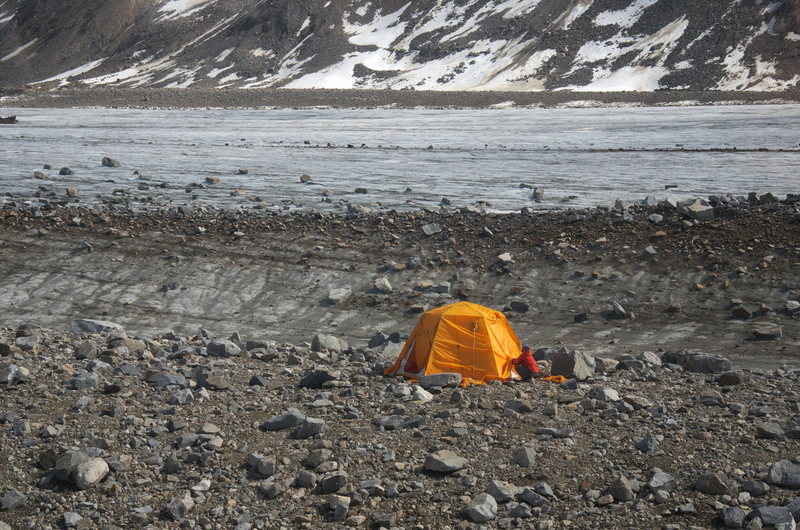 This thing could drain at any moment so we raced back to camp to set up the survey equipment. 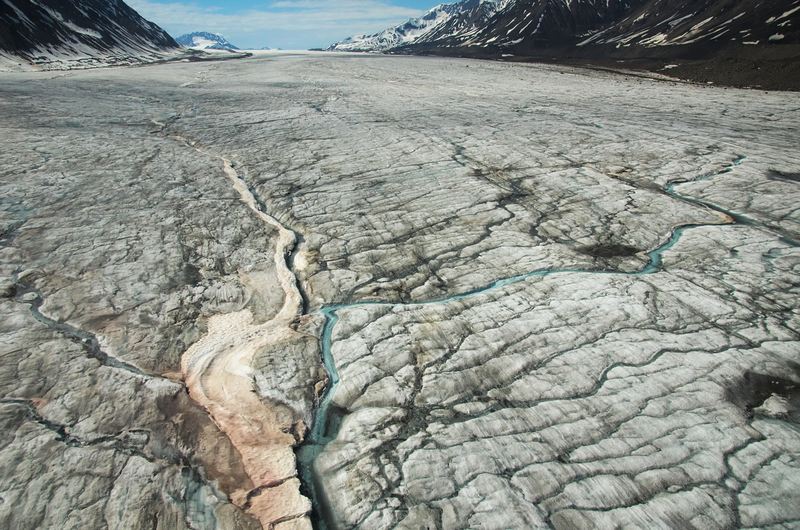 The surface of the Black Rapids Glacier scoured by streams. One partially snow-covered stream remains. That one was fun to cross the first few days. We return as Andy is nearly finished setting up the kitchen. Martin drills a hole to place a reflector for the theodolite. The air is clear, really clear for summer. Mt. McGinnis in the background. The theodolite and radar set-up and measuring by late afternoon. In for the night. Home sweet home.